With Josh (Patrick Wilson) and Renai (Rose Byrne) still coming to terms with the death of parapsychologist Elise, the Lambert family move into their grandmother Lorraines's home. However all is not well as Josh and Renai continue to experience the demonic forces that are set on turning their lives to chaos. With Josh's increasingly bizarre behaviour, Renai is forced to seek help to protect her family and in uncovering the truth she soon..
Before the haunting of the Lambert family, gifted psychic Elise Rainier reluctantly agrees to use her ability to contact the dead in order to help teenage girl Quinn Brenner, who has been targeted by a dangerous supernatural entity and is suffering vicious attacks from an unknown demon. 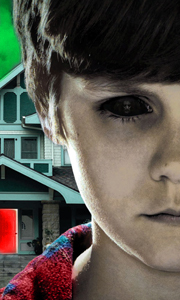 Written and directed by franchise co-creator Leigh Whannell, Insidious 3 is the most terrifying chapter of the Insidious story so far, going back to whe..
Insidious: Josh (Patrick Wilson) and Renai (Rose Byrne) are a happily married couple with three young children who have moved into their idyllic new suburban home. When tragedy strikes their young son, Josh and Renai begin to experience things in the house that are beyond explanation. Insidious 2: After the traumatic events that plagued their family, the Lambert family move into their grandmother's home. However all is not well as Josh ..
Insidious: Josh (Patrick Wilson) and Renai (Rose Byrne) are a happily married couple with three children who have moved into their idyllic new suburban home, When tragedy strikes their young son, Josh and Renai begin to experience things in the house that are beyond explanation. Insidious - Chapter 2: After the traumatic events that plagued their family, the Lambert family move into their grandmother's home. However all is not well as J..
Insidious: Josh (Patrick Wilson) and Renai (Rose Byrne) are a happily married couple with three young children who have moved into their idyllic new suburban home. When tragedy strikes their young son, Josh and Renai begin to experience things in the house that are beyond explanation. Before long, their lives are turned upside down by demonic forces, hell-bent on terrorising their very existence. Forced to seek help and protect their fa..
Own Insidious / Insidious - Chapter 2 DVD from Deff, DVD, Blu-Ray & 4K Video Specialists - Free UK Delivery..
Josh (Patrick Wilson) and Renai (Rose Byrne) are a happily married couple with three young children who have moved into their idyllic new suburban home. When tragedy strikes their young son, Josh and Renai begin to experience things in the house that are beyond explanation. - Before long, their lives are turned upside down by demonic forces, hell-bent on terrorising their very existence. - Forced to seek help and protect their family, t..
Own Insidious The Last Key Blu-Ray from Deff, DVD, Blu-Ray & 4K Video Specialists - Free UK Delivery..
Own Insidious The Last Key DVD from Deff, DVD, Blu-Ray & 4K Video Specialists - Free UK Delivery..